There are a million dog run ideason the internet, but why invest the time money and effort? Maybe you’re tired of muddy paws and dead patches on your yard. Is shifting gravel and cold concrete starting to wear you down? Then it’s high time you make the switch to artificial turf. After all, it’s never too late to get a space that both you and your fur baby will love! Check out these cute dog run inspirations before you start designing your own. Cute in its own minimalistic way, this dog run is great for exercising and playing with your best buddy. Complete with an efficient drainage system, this pet run also serves as a great place to potty train your puppers. Dogs are intelligent creatures. Aside from keeping their bodies active, pet owners should also provide their pets with constant mental stimulation to keep them sharp. This pet run offers exciting and invigorating features that your pets will surely love. Created with multiple mediums, this pet run provides dogs with various sensory stimuli. From smooth rocks to soft grass surrounded by cold and rough concrete, this area is the perfect place to practice agility and impulse control. Built for agility training and endurance, large pet runs are perfect for high energy dogs that require huge amounts of daily exercise. As some breeds need more exercise than others to prevent naughty behavior (chewing, digging, excessive barking, etc.) and weight problems, it’s just right to provide them the means necessary to stay in great shape. It’s sweet, it’s simple, it gives off a soft vibe that will make you smile. This feminine pet run minimizes the use of hard corners and is decorated with flowers that further highlight the space’s femininity. Perfect for small breeds, this pet run can easily be the star of your backyard or even your home. Pet owners who live in small apartments would do well to copy this look. The low, white picket fences make the setup look homey while the small plant boxes draw attention away from the hard looking tiles and balcony borders. The small, wooden dog house adds warmth to space and makes the pet run look even more put together. This pet run utilizes earthly materials where your pet dog can rest after a tiring day of playing under the sun. Accentuated by flowerpots, this space does not only serve as a pet run but a place where you and your buddy can hang out together after hours of fun and play. A space specifically built with get-togethers in mind, this pet run encourages pet owners and their pets to play and stay active together. The generous floor space and wooden tables will allow you to rest while sharing pet care tips with other fur mommies or daddies. This pet run does not only look neat, but it also reflects how the humans of this household prioritize their pet’s safety. Although limited in size, this style allows pet owners to supervise their dog’s activities by providing cobblestones they can use to accompany their fur babies while they do their business. Shade, check! Flowering tree, check! Swing for the hoomans and the doggos, check! This pet run is all that any pet owner or pet could ever ask for. An ample place to run and roll around in, this space also allows the family to spend time and cuddle while being graced by a beautiful view. With a perfect balance of modernism and natural accents, this pet run will definitely make your dogs feel like the luckiest dogs in the world. 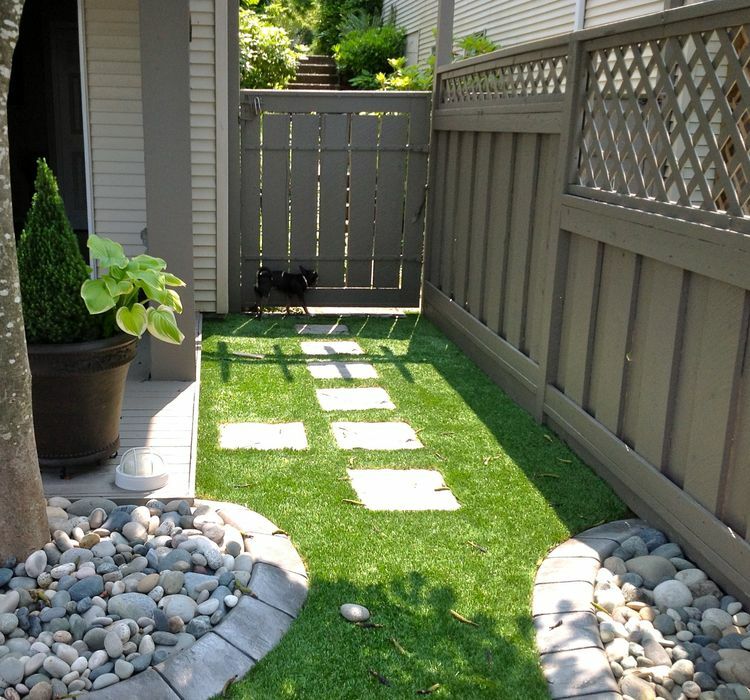 Ready to DIY your synthetic turf dog run? Use ZeoLite Organic Infill to trap and control odor left by your pets. Zeofill is organic, natural, and environmentally safe for your pet and family’s protection. For more information on what kind of artificial grass to use for your pets check out our MegaPet collection.